Ready for summer? I sure am! This delicious Lemon Raspberry Parfait is the perfect dessert get me out of the winter doldrums. It would make a great Easter dessert as well. 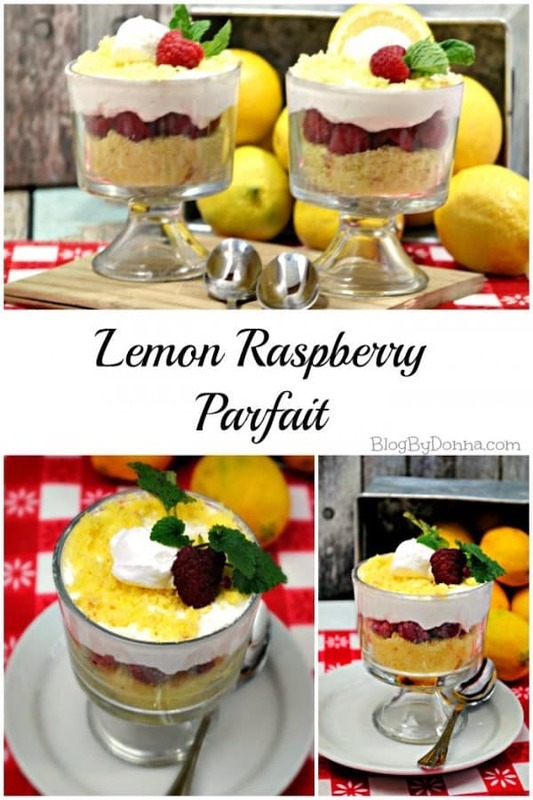 I love lemon desserts, so this parfait is perfect anytime for me. I love individual desserts, it always makes, not just kids, but even adults feel special to have their own individual dessert. 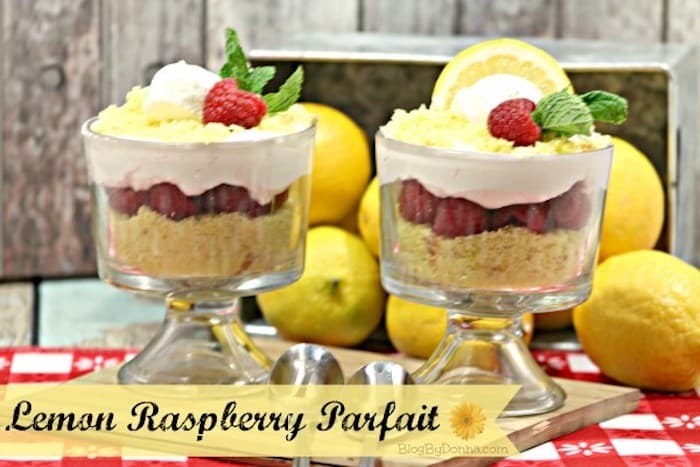 This lemon raspberry parfait is a great way to showcase individual desserts. It’s pretty, delicious, and the lemon infused whipped cream is OH. SO. GOOD! Preheat the oven to 350 degrees. Prep a 12 X 9-inch cake pan with baking spray. Sift together the flour, baking powder, and salt in a bowl. Mix the milk and vanilla together in a measuring cup. Beat the butter with an electric mixer on medium speed until it is light and creamy. Continue to beat the butter while adding the sugar beating until fluffy. Add the dry ingredients in 3 equal parts, alternating with the milk/vanilla mixture. Beat in the lemon zest. Mix well. Scoop the batter into the pans. Bake at 350 degrees for 35 minutes, or until springy. Allow to cool completely. Crumble. Set aside. With an electric mixer beat on medium speed until the cream holds a soft peak. Store in refrigerator until served. Whether you make this lemon raspberry parfait for Easter or any time of the year I’m sure you will enjoy it. It is one of my very favorites! If you love lemon or lemon flavored desserts, you will love this, too! If you’re looking for other lemon inspired recipes for Easter, spring, or summer, check out these Lemon Lavender Butter Cookies. Remember, if you like this post, please take the time to follow all my projects and finds here on Pinterest. 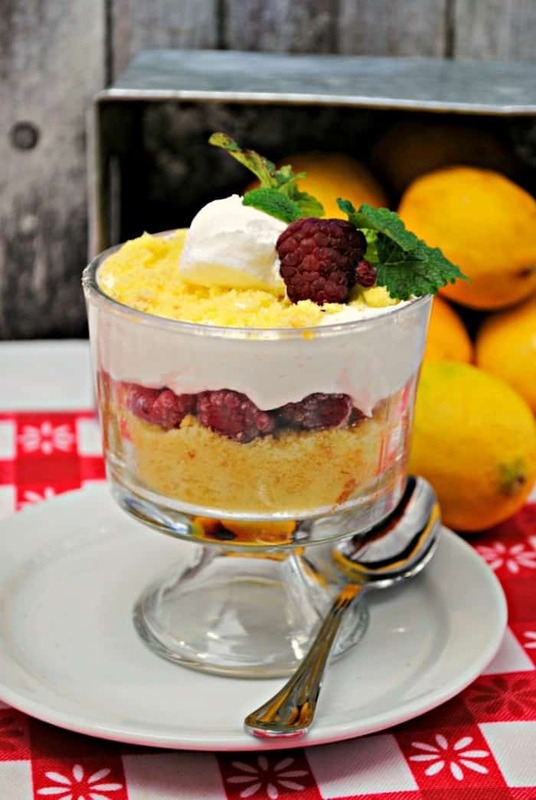 You can pin this Lemon Raspberry Parfait HERE for later. What a cute fun dessert! This looks so good. I can’t wait to try the recipe. Thanks! Thanks for the recipe. Lemon and raspberry are some of my favorite fruits. This looks so good. Lemons are my father’s favorite fruit, raspberries are mine. The love for sour food are in my family.